I am often amazed at how many calls we get from people who want to look at homes for sale in The Bluffs on the Waterway. This gated community gives you a sense of security while offering every amenity you could possibly want. You can drive you golf cart to the beautifully designed clubhouse and let the kids enjoy the pools while you relax in the sun, or you can pull out the boat and enjoy the day on the Intracoastal Waterway without leaving the community. 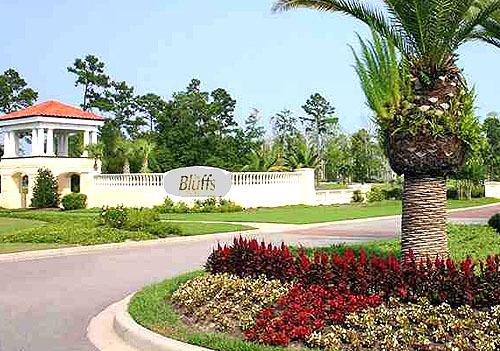 The Bluffs on the Waterway homes for sale represent one of the best all around values that the Myrtle Beach real estate market has to offer. For those that have a boat, you can utilize the community boat storage so you don't have to clutter your garage. If your passion is golf then you are only a few minutes from the areas most popular golf courses. If you run out of milk, you are only 2 minutes from the new grocery center. Take a look at the homes for sale in The Bluffs on the Waterway and if the perfect home doesn't appear then you have the option to choose a vacant lot and have a home custom built especially for you. Browse through the MLS listings for homes in the Bluff or other great communities on our Carolina Forest pages! We are your Myrtle Beach real estate resource.